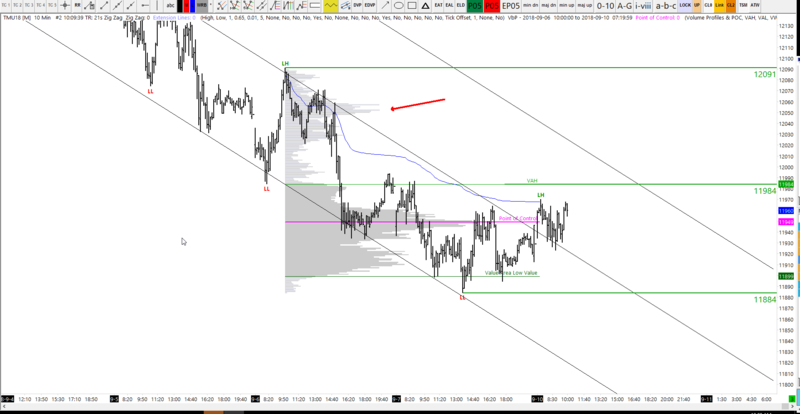 The bounce up to 12046-12060 is finding some resistance just above 12k, and coincidentally we’re finding resistance at the top of this regression channel. Good progress so far today, to break the 7-day-consecutive losing streak. 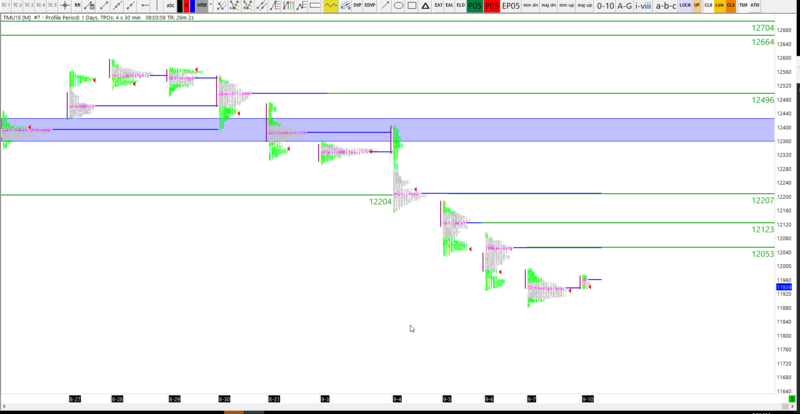 The thoughts for 12046-12060 zone are based on this composite volume profile which was drawn from the last confirmed swing high (the lower high). The zone represents the high volume area above the value area (hopefully you can make it out on the volume profile). 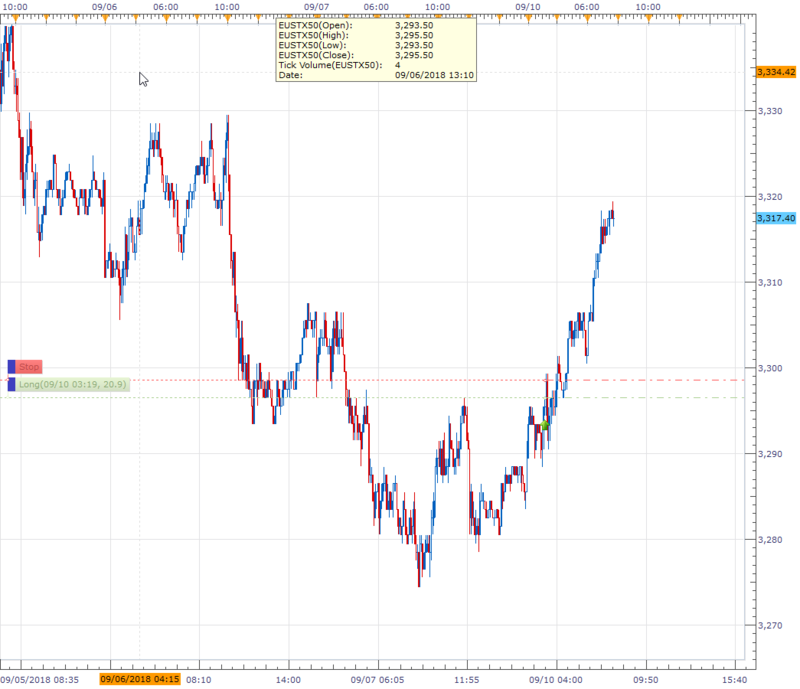 Went long shortly after the webinar on EuroStoxx, which is holding up okay so far. Good morning traders. Can we finally break the string of seven consecutive daily losing candles on the DAX? Last week the German leading index lost more than three percent. But there are still some issues surrounding the general trading environment. The trade war, the risk of a dirty divorce of the British from the EU, the Italian debt crisis and of course the emerging market crisis. The tariff dispute could drag on for weeks and without an end date in sight, traders will probably remain nervous. At the same time, additional US punitive tariffs are threatening $ 200 billion in Chinese imports. If President Donald Trump turns on the pressure, China will strike back immediately. Turkey is again coming to the fore in emerging markets. The central bank advises on Thursday on measures to stabilize the currency. Without an appropriate response 3-4% rate hike – the lira will continue to depreciate and the risk of introducing capital controls will increase. Watch out for Thursday this week, because it’s a busy one for the central banks. All eyes are on the 12k level, if we manage to break through this from the underside, with strength/momentum, then we start to form a ‘pivot component’ at what would be the bottom of this major bearish impulse wave. The current wave is 700 points, so you would be forgiven for thinking that a bounce is normal at this stage. Of course, should the DAX continue to break to the downside, and take out 882, it’s business as usual. 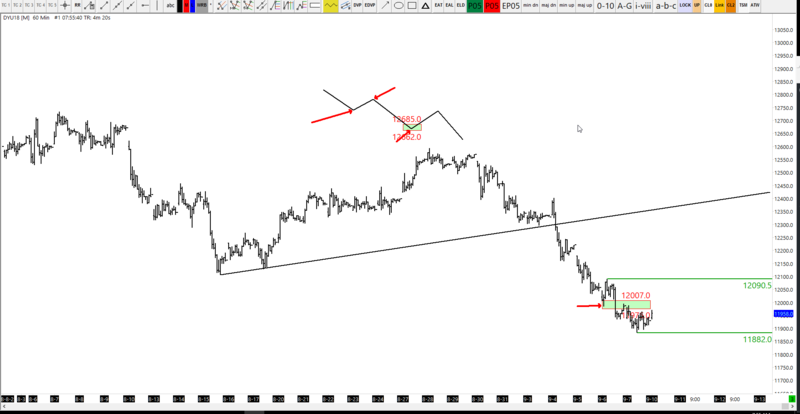 For more information on pivot components, visit the comprehensive swing trading course in the member section. Find out more here. 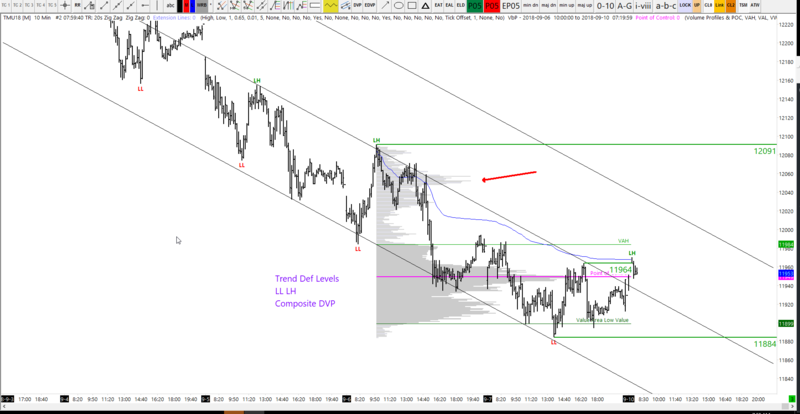 We have traded inside the lower half of this regression channel for most of last week. Today, we are making progress to breaking out higher. 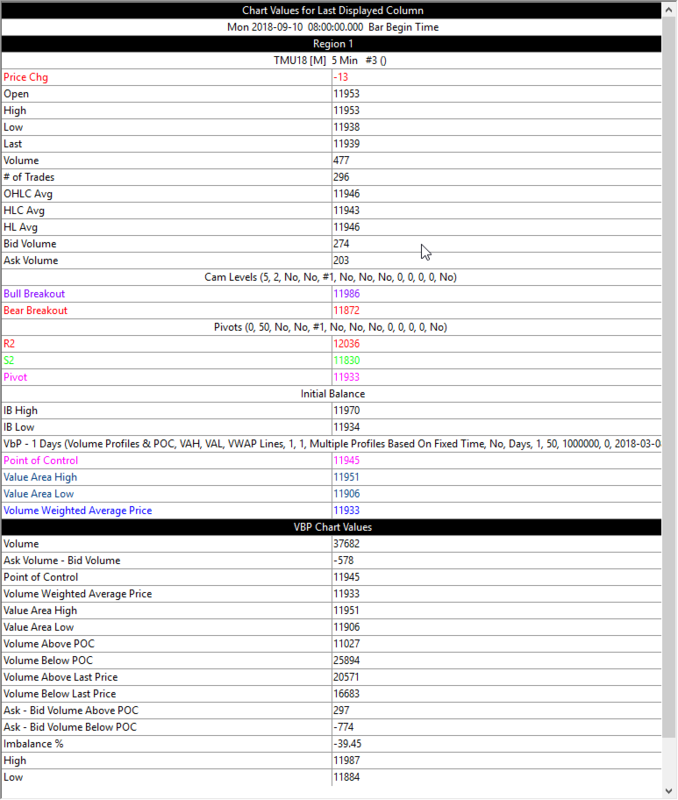 I have pulled a composite volume profile from ‘the most recent confirmed lower high to current’. The profile shows a double distribution. 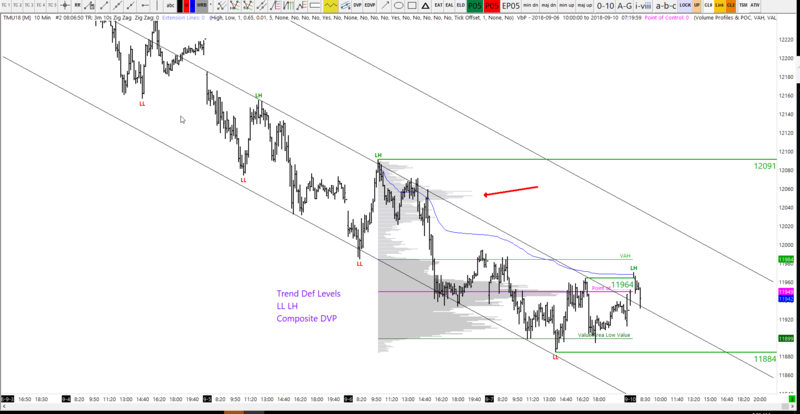 I am interested to see the reaction at the underside of the composite value area high. If we break through that, perhaps we can see a move to the higher volume area above. 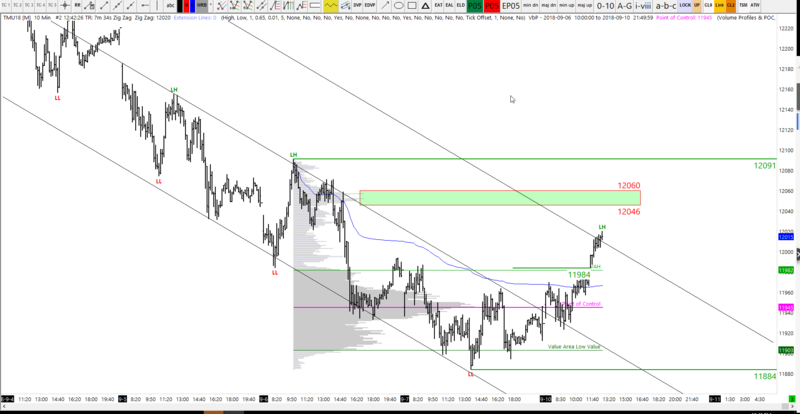 For more information on volume profile components, visit the comprehensive swing trading course in the member section. Find out more here.